Panasonic TX-P37X10 review | What Hi-Fi? 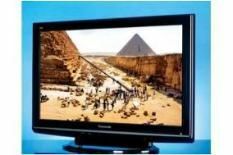 The 37 inch TV market is dominated by Full HD, LCD TVs, so the Panasonic TX-P37X10 – an HD-Ready plasma – goes against the grain. But don't write this flatscreen off just yet – a 37in Panasonic of the same spec was our 2008 Award winner in its size class. For the money, the 'P37X10 isn't missing much in terms of features and functionality. With three HDMI inputs, component video connections and a couple of RGB-capable Scart sockets you shouldn't be too disappointed. You also get an integrated Freeview tuner and an SD card slot that allows you to view photos stored on a memory card. It's refreshing to see a plasma TV at this screen size, especially when you remember the traditional strengths of this type of set over the LCD models that dominate at this screen size. The absence of a backlight allows the Panasonic to reproduce stonkingly good blacks. Where some of its LCD rivals allow for some annoying backlight bleed to creep into the picture, the 'P37X10 maintains solidity and depth. As Hancock struts around in his superhero suit, the Panasonic set treats you to luscious black levels – the shiny black material never appears grey or washed out. Fast movement of panning doesn't cause the screen any consternation either. One area where the 'P37X10 has to hold its hand up though, is resolution. When tested with high-definition content, its 1024-x720 pixels simply can't display the same level of detail as its 1920x1080 Full HD rivals. Skin and clothing textures don't display the same sense of realism, and looking side by side against some rival Full HD sets, the image appears soft. Switch to standard-definition material and the Panasonic is far more competitive, aided by having to do less picture upscaling. Images from the internal Freeview tuner look pleasant too, with lush, natural colouring and decent levels of detail. Sonic performance is also notable, with this set's speakers sounding relatively open and clear compared to some of the muffled offerings from rivals (Sony S Series, please stand up). The 'P37X10 doesn't have the bells, whistles or comprehensive spec of many of its competitors, but there are areas where this plasma excels. If you're looking for a one-stop set on which to to enjoy Freeview TV and DVDs, this may be it. But if you're a big Blu-ray fan, you may want to look elsewhere.